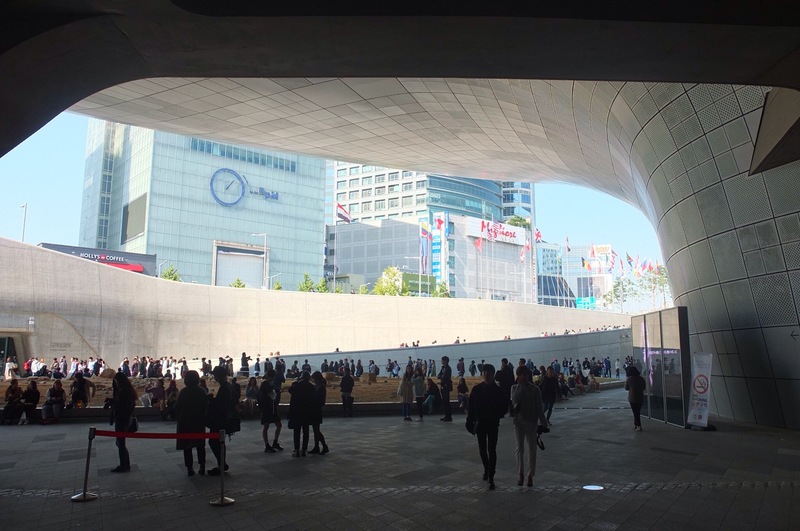 Dongdaemun Design Plaza is a landmark building in Seoul with really unique architecture. A lot of curves and ups and downs. Very futuristic looking. It was designed by Zaha Hadid, who – amongst many other buildings – also created the London Aquatics Centre (click here for photos of it). We originally just went to check out the architecture and take photos of the unique structures of the DDP. Turns out, we picked the day that was the start of Seoul Fashion Week! This took us by complete surprise. But it turned out to be highly interesting to watch the fashionistas, bloggers, photographers, models and want-to-be models. There was an incredible amount of fashionable people. I approached several to ask if I could take their photos. This guy was clearly waiting for someone to photograph him. He posed like a pro. Notice the fingers. Yeah, I don’t think they liked me much. It was quite busy with people hanging around and waiting for celebrities to appear. I can only assume that they were models or designers maybe… I had never seen any of them in my life! From time to time a photographer would ask someone to pose for a photo and straight away, 20 other photographers would run up to the spot and take the same shot. It was so funny to watch! Or there would be someone emerging from the building and straight away, everyone would run (and I mean RUN) up to them and take photos. 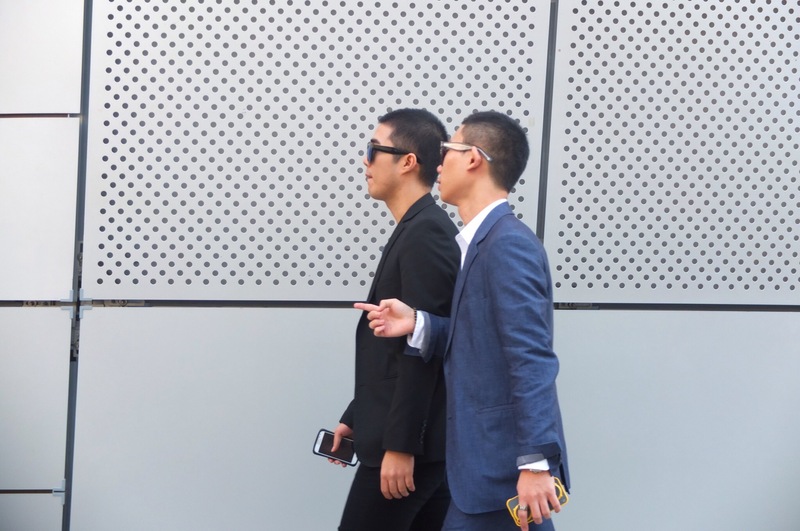 Again – no idea who these people were but they must have been pretty famous in the Korean world of fashion. OMG, models! They were really tall, taller than me! And they were wearing tons of make up. This photographer was already getting tired and had to sit down. I took some more random shots of fashionable people. 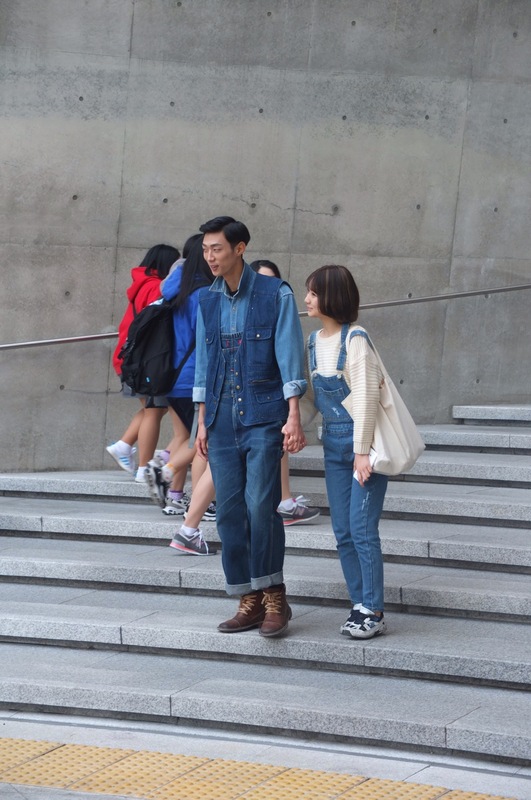 This cute denim couple was very popular with photographers. And then I was approached by a photographer! A guy asked me if he could take photos of my trainers. Erm… yes, sure! I can only assume that he was looking for the most unfashionable footwear of Fashion Week or something. People queuing up for the next show. We saw the rehearsal through the window. Looked pretty good! 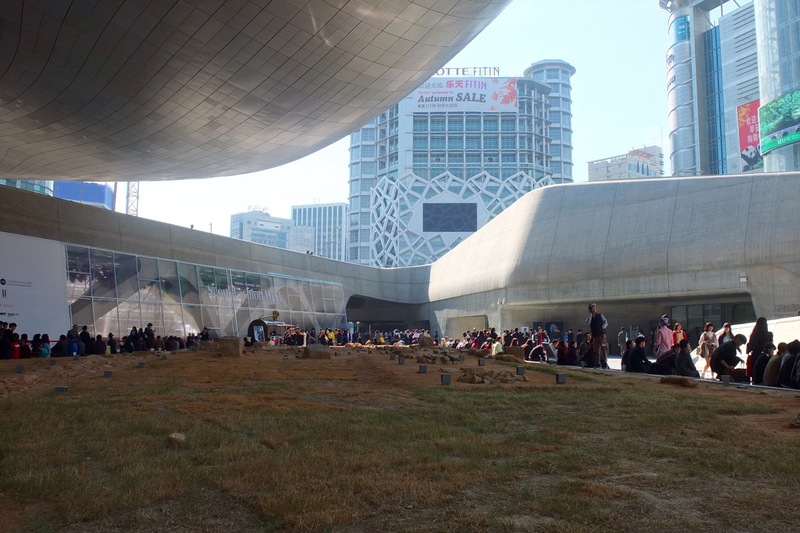 Most people were hanging out around this lawn area and waiting for celebrities to appear.